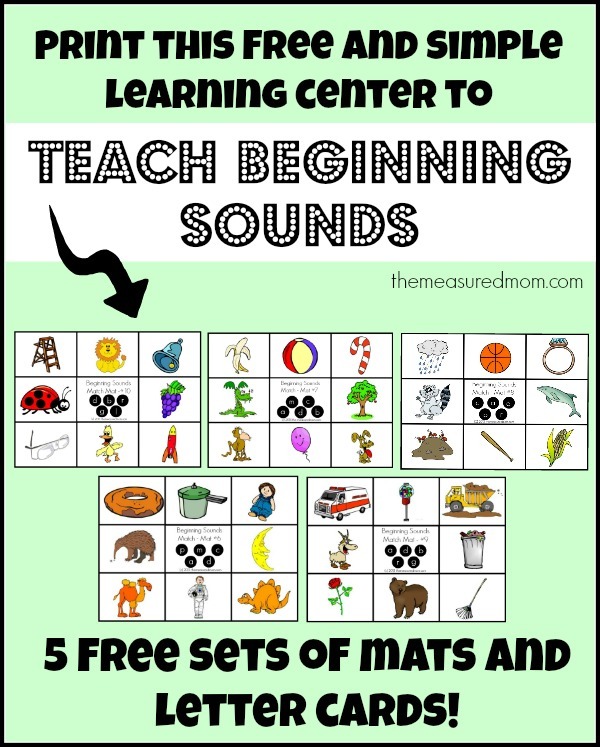 Free beginning sounds activities -five more match mats! Before we can expect our new readers to sound out words with confidence and success, they need to have a strong handle on beginning sounds. Some kids pick these up with little or no effort from us. Reading to my oldest two kids (now ages 6 and 5) , singing alphabet songs, and talking about the sounds letters make was all I needed to do . Their next sibling (now age 3 1/2) hasn’t picked them up as easily. He has benefited from direct alphabet instruction to learn his letters and sounds — and I’ve created these mats to give him more practice. He loves them! These are the second set in my series of Beginning Sounds Match Mats. I’m teaching my two preschool boys to read with my own resources alongside the fabulous preschool reading curriculum from This Reading Mama, Reading the Alphabet. 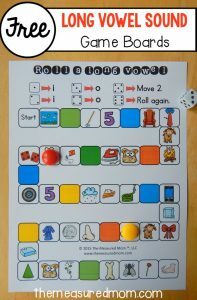 You can use this set of mats whether or not you are using Reading the Alphabet, but you might be interested to know that I add new letter sounds in the same sequence as Reading the Alphabet. This set contains mats #5-10. Here’s how it works: mat #1 compares just two letter sounds. Mat #2 compares three. By Mat #4 children are working with five different letter sounds. Old letters drop off the succeeding mats as a new letter is added. The newer letters always have more pictures beginning with their sounds. (Get the first set of mats (#1-5) in this post). Let me show you what I mean. Here’s Mat #8. Since previous mats have already covered letters c, a, and d quite a bit, there is only one picture for each of them (corn, ants, and dolphin). Letter b was just introduced in the previous mat, so it has two pictures (bat and basketball). Letter r is new for this mat, so it has three pictures (raccoon, ring, and rain). How can you use these mats? 1) They’d be a great learning center in a classroom. 2) I also think they’d work well for reading tutors. 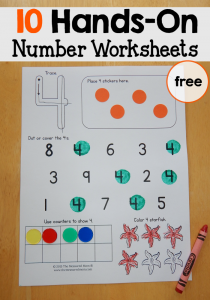 3) At home, you can use them with your child who needs work on beginning sounds — whether that’s your preschooler, kindergartner, or older child. No need to do the whole stack at once — a few at a time is enough. Sit with your child the first few times, and when he’s ready to do them independently you can have him work at the table while you prepare dinner. Consider sliding them into a bag for long waits at the doctor’s office! Assembly takes a few minutes, but you’ll have lasting learning center after you take the time! 1) Print the mats and sets of letter cards on cardstock. 2) Laminate. (I love my affordable home laminator – one of the best purchases I ever made! I can get laminating sheets for just 15 cents each on Amazon). 3) Cut apart the cards. 4) Attach clear Velcro dots to the mats and the fuzzy connecting dots to the backs of the alphabet cards. If you want to go a cheaper route, try using sticky tack. 5) Punch holes in the mats and put them in a 3-ring binder for easy storage. Great news! All 25 mats are now complete AND available in one easy download! Click HERE to get to my post which shares all 25 mats. Very useful. keep it up. 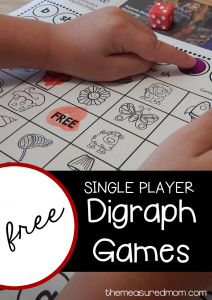 Another wonderful resource! I just love your blog! Thank you so much for your kind comment, Meghan! I hope you had a wonderful Christmas! Thanks so much for the feature, Deb! It was a helpful boost to my low December traffic and brought my Facebook numbers up too 🙂 I hope you had a a wonderful Christmas! Hi, I am here from the Share It Saturday link-up! 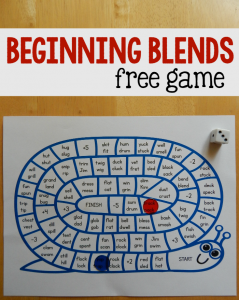 This is adorable, and a fun way to get my 3 year old started with letter sounds! It’s funny how kids are so different. My older daughter LOVED doing workbooks, but letter sounds didn’t really click until she was 5 (still totally normal). My 3 year old seems more ready for it, though. Thanks for putting these together! I’ve been using RTA with my eldest (almost done!) and was looking to make exactly this game. Your printables have saved me quite a bit of time! I’m so glad to hear it, Allanah! I still have to finish these — two more sets to go. Feel free to send suggestions of other printables you’re interested in. I’m not always able to do what readers suggest, but if I have time and I think a lot of people could use it, I am often able to follow up on suggestions. Thank you for all the work mats and other learning tools that you share with us. We all have different talents and it is wonderful that you share your knowledge and expertise with teachers and moms that are not talented in the creation dept. 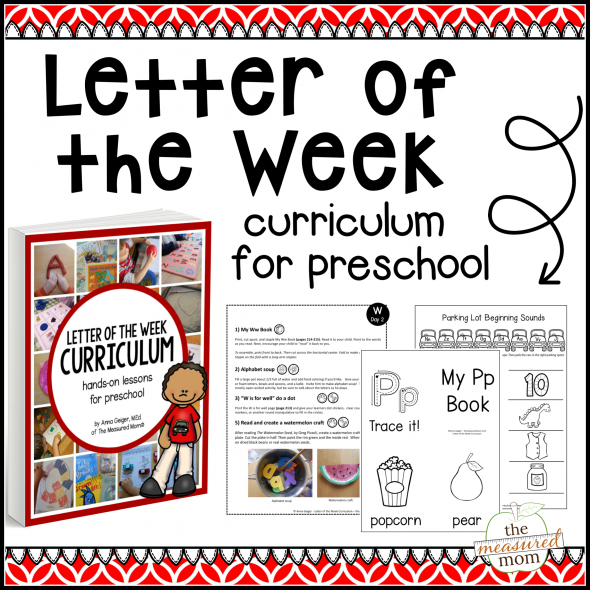 thank you so much for this excellent, preschool resource. Thanks soooo much for making homeschooling so much fun!!! My 2 yr-old is learning how to read and these mats are perfect for him. He LOVES them! I started with the first 2 mats and am back to print more since he has can identify those sounds fairly well. You and This Reading Mama are my absolute FAVORITE educational bloggers! Please keep the wonderful games coming! My kids love them so much they scream with delight whenever we do them, and Saturdays at home are spent “playing” them. Call me silly, but I’m getting confused. On Mat #22, there are words with “X”, however they aren’t beginning sounds of the word like the mat is working on, but actually the ending sound (fox, six). Am I missing something? There are a few like this. Thanks!